Truly “a tale as old as time,” iterations of the Beauty and the Beast story can be found in the folk tales of cultures across the world. While the popularized French version that features a generic-looking beast is often the one that comes to mind, most versions spin the tale with a more identifiable animal bridegroom. Be it a dragon, bear, snake, frog, or the god of love, the unwitting, beautiful bride is always in for a surprise. Here, we’ll introduce you to five other Beauty and the Beast tales, and share their distinct differences. Though the god of love in Greek mythology was not an ugly beast by any means, Cupid graces this list because his relationship with Psyche is said to have influenced the various Beauty and the Beast stories that came after. While there are many differences between this story and the popular version of Beauty and the Beast, there are still a few notable similarities. See them for yourself... Brendan Pelsue’s TED-Ed video tells the story of Cupid and Psyche best. After months of residing with the monster, and turning down his daily marriage proposals, Zelinda is given a cruel ultimatum. The monster tells her that her father is on his deathbed and will die without seeing her one last time, which she cannot do unless she consents to marry him. It’s not much of a choice, but Zelinda agrees, because she loves her father more than her own happiness. The monster transforms back into his true form, revealing himself to be a handsome prince. He thanks Zelinda for freeing him from a witch’s curse. This version of Beauty and the Beast is not a happy one, although it initially appears to be. 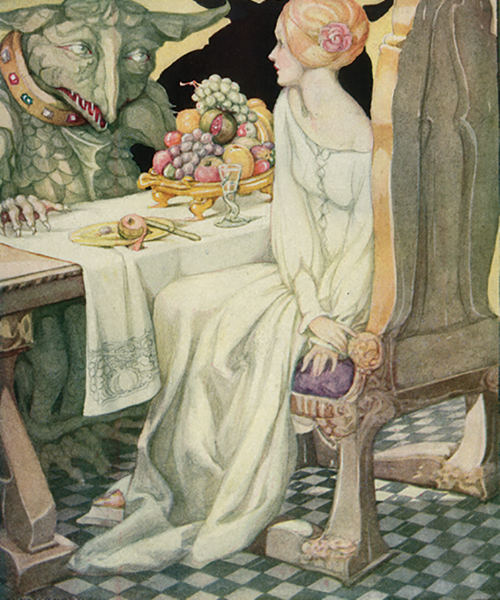 When the Maiden’s father stays at the beast’s enchanted palace, the beast, without showing himself, genially instructs him to eat his fill, spend the night, and bring back his daughter in three days time. The maiden’s father does this without question and upon their return, the beast’s cordial behavior continues. He asks her father to stay for three days to ensure she is not frightened, and sure enough, his daughter is a happy woman when he departs. The beast’s proclivity for doing things in threes persists. The Maiden receives news of her sister’s impending marriage. He allows her three days to go to the wedding, even though he does not think she will return. 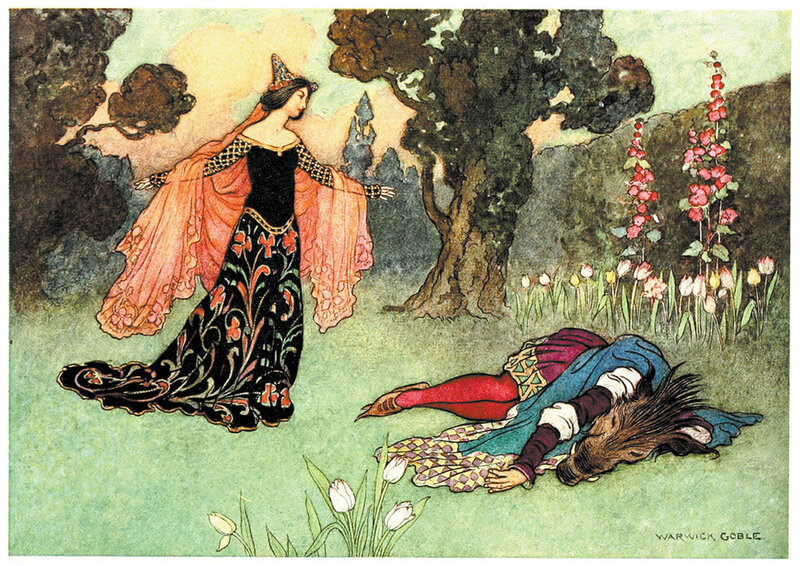 The Beast gives her a magical ring to remember him by and tells her that he will send a white horse to bring her back, but it will leave on the third day with or without her. The Maiden follows the Beast’s instructions. When news of her second sister’s wedding reaches her, the deal is the same and, as before, the Maiden returns in three days. However, when she goes home for a third time to be with her dying father, the Maiden’s sisters remove the magical ring from her finger while she sleeps, and she does not remember to return to the enchanted palace until too late. Not only has her father died during this time, but she finds the Beast on his deathbed, as well, and is unable to save him. Overcome by grief, Maiden refuses to eat or drink, and she soon follows her father and the Beast to the grave. Thankfully, this Chinese iteration has a far happier ending. Every day, a man brings home flowers to his three daughters to use as patterns for their embroidery, but one day there are no flowers to be found along his route home. He wanders into the woods to look for wild blossoms, but accidentally stumbles upon the domain of the Fairy Serpent. Upset by the intruder, the Fairy Serpent coils around the man until he promises to give one of his daughters to him in marriage. The man returns home, but is sick with worry and unable to eat. His two eldest daughters refuse to wed a snake, but the youngest agrees to the engagement, if only her father eats again. When the youngest daughter does not immediately go to the Fairy Serpent, he sends wasps to sting the family until she comes to him. While she finds the Fairy Serpent repulsive to look upon, his kindness and devotion win over her heart. One day, the young woman finds the well dry and leaves to find water elsewhere. When she returns, she finds the Fairy Serpent dying of thirst. 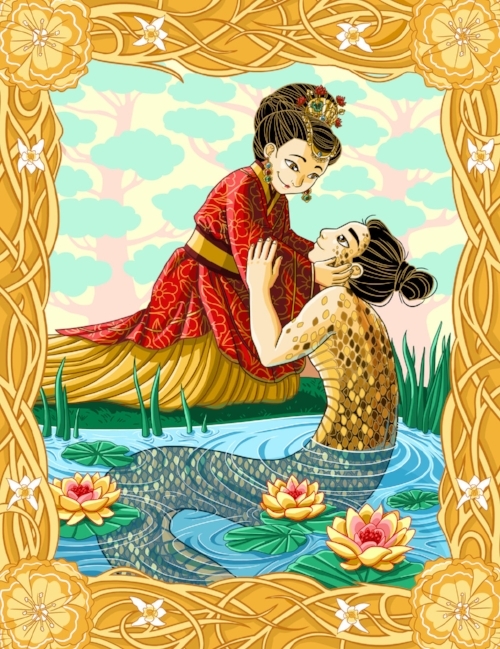 In her eagerness to save him, she plunges him into the water, and he emerges a handsome young man. Lastly, the Norwegian version of the Beauty and the Beast tale closely resembles the story of Cupid and Psyche. A White Bear meets a poor man on the road and offers him riches in exchange for his youngest daughter. Eager for the exchange, despite his daughter’s outright refusal, the man asks the Bear to return in a week to give him time to change her mind. By then, she relents and rides to her new home on the Bear’s back. At night, under the cover of the dark, the White Bear sheds his pelt, takes on the form of a man and lies down in bed next to the young woman. However, she never sees him in this state, because he always leaves before daybreak. Days pass, and the young woman longs to see her family. He grants her permission, but warns that bad luck would befall them both if she lets her mother speak to her alone. The woman tries to heed the White Bear’s warning, but her mother eventually wears her down. Worried that her daughter might be sleeping next to a troll, the young woman’s mother gives her a piece of candle to hide in her dress and bids her to light it when her night visitor is asleep. On the night that she returns, she lights the candle and sees a handsome prince laying next to her. When she kisses him, she accidentally drips wax onto his shirt, and he wakes up. Upset, the man explains that his step-mother bewitched him. A White Bear by day and a man by night, he tells her that he had to be married for an entire year without his wife seeing his true form to break the spell. But since the young woman looked at him too soon, he has to return home and marry a troll princess with a disturbingly long nose. Thankfully, the young woman manages to find him just East of the Sun and West of the Moon and rescues him from his troll bride. If you want to hear the classic version of Beauty and the Beast the way it was meant to be heard, including the story’s lesser known prequels, check out the first five episodes of Tales. Tales is a Parcast podcast that presents fairy tales the way they were originally told: orally and unadulterated.